Aerial Recon Ltd. is excited to announce that Robinson Helicopter Company has unveiled an optional 43-gallon auxiliary fuel tank for the R66 turbine helicopter that is now available in Canada. This tank increases the helicopter’s range by as much as 200 nautical miles and makes the endurance close to 5 hours! Priced at $32,000 USD, the system is available for R66s ordered after 15 January 2016. The tank only weighs 37lbs and is placed on a fibre glass tray that is installed in the front section of the baggage compartment. The aft section of the baggage compartment can still accommodate storage and up to 100lbs of cargo. Both the tank and the tray can be removed by an AME. 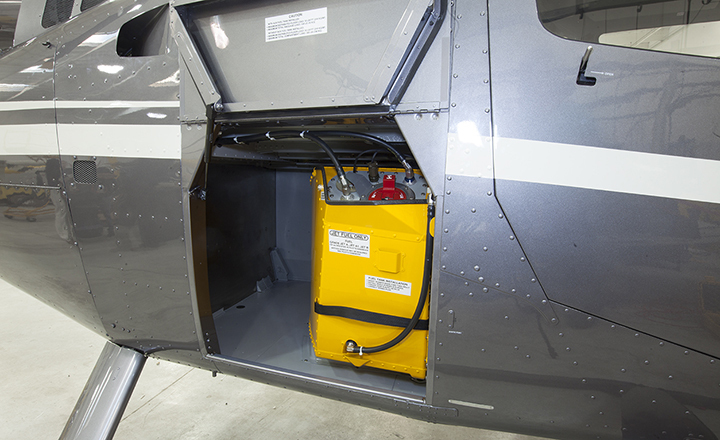 A crash-resistant fuel bladder contains an internal fuel pump that pumps fuel to the helicopter’s main tank at approximately 40 gallons per hour. The controls are located in the upper avionics console and feature a fuel ‘Quantity’ button, a ‘No Flow’ annunciator light and an ‘On/Off’ switch. Robinson continues to release new updates and features for their fleet of helicopters. This new capability of the R66 will allow it to go further beyond the competition and prove an even more effective helicopter in both the commercial and private market.